Most travelers would agree that air travel has lost its luster. New security regulations, extra fees, fewer amenities, and disgruntled employees have made many travelers dread the entire air travel experience, from airport parking to baggage claim. But not all airlines have ditched on-board amenities to cut costs. Some airlines continue to offer meals and snacks, in-flight entertainment, and relatively comfortable coach-class seats. Understanding which airlines offer what amenities will help you know what to expect the next time you fly. In-flight entertainment includes seat-back televisions, first-run movies, satellite radio, and hand-held DVD players. Hands-down, the winner in this category is JetBlue. 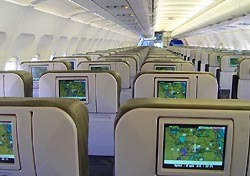 The low-fare carrier has offered seat-back televisions with complimentary live DirecTV service since it began flying in 2000. It has since expanded its offerings to include complimentary access to more than 100 channels of XM satellite radio, and first-run movies for a $5 charge on some flights. JetBlue also gives away free headphones for travelers that didn’t bring their own. Other carriers don’t come close to offering the variety of complimentary in-flight entertainment. Low-fare airline AirTran also offers 100 channels of XM satellite radio for free, and United offers a sampling of XM channels on some flights. DirecTV is available on Frontier for $5 per flight segment, and Disney and first-run movies cost $8. On some flights, Alaska and Midwest rent handheld entertainment devices called digEplayers for $10, which come stocked with a selection of movie, television, and music choices. Legacy carriers offer in-flight movies on longer domestic flights, as well as limited television and music programs. Low-fare carriers Southwest and Spirit do not offer in-flight entertainment, and ATA offers only a handful of music channels. Gone are the days of free meals on domestic flights. While all airlines offer complimentary meal service on international flights, many carriers have replaced meal service with pre-packaged buy-on-board meals and snacks. Continental is the exception, as it is the only legacy carrier that continues to offer complimentary hot meals and snacks on its domestic flights, and is the overall winner in the meal category. Other carriers that offer a good selection of complimentary snacks include Alaska, Delta, Frontier, JetBlue, and Southwest. For example, Alaska offers cookies and beverages on short flights, food for purchase on some flights, and hot sandwiches and small side items on cross-country flights, while Delta provides small snacks like granola bars, chips, crackers, and cookies on short flights, and snack boxes with cheese and crackers, cookies, and dried fruit on longer flights. Frontier’s offerings include bagels, muffins, cookies, warm pretzels, and similar items on certain flights. JetBlue passes a basket with chips and other snacks, and Southwest offers peanuts and snack boxes on many flights. Additionally, Midwest‘s “Signature Service” flights feature warm chocolate chip cookies. Legroom can make or break your flight. Unfortunately, economy-class seats generally have about 30 or 31 inches of pitch (an industry term for the distance between seats), not enough to comfortably accommodate the average traveler. Limited legroom and full planes equal cramped conditions for coach travelers. But, some airlines offer more legroom than others, and JetBlue, Frontier, and Midwest are among the best. JetBlue offers 33 or 34 inches of legroom (depending on the plane) in rows 11 and back. As an added plus, all of JetBlue’s seats are leather, which many travelers find more comfortable. Midwest also offers between 33 and 34 inches of legroom on its Signature and Saver flights, and its Signature flights also have all-leather seats. Frontier offers 33 inches of legroom on every flight. Southwest’s entire fleet has leather seats and 32 or 33 inches of legroom. Flying doesn’t have to be completely unpleasant. Perks such as comfortable seats, in-flight entertainment, and complimentary food will not only make flying more enjoyable, but also help you get more for your money. Keep this guide to airline amenities in mind as you book your next flight, and you’ll be able to make an informed decision about which airline to fly.